Most of us can take a good photo on our phones during the day, but taking a photo at night is more challenging. Being in a low-light situation creates a series of challenges that you don’t experience during the day. As a result, we’ve put this guide together to help you take better photos at night, or at least in low-light situations. What’s the benefit of taking a photo at night? Shooting at night creates a different perspective for your photos that you can’t get during the day. Because of the way that the light falls, you can create the impression of romance, magic or mystique in your shots that you might struggle to do during the day. One of the biggest issues that you might have when taking photos at night is getting blurry photos. This is because there is not enough light in your shot. The solution to this is set the shutter speed correctly. So what is the shutter speed of the camera? The shutter speed is the length of time that the shutter of the camera is open for. If it is open for longer, more light goes through the lens and hits the camera’s sensor. As a result, you need more light to reach the sensor at night, so the shutter has to stay open for longer. This makes perfect sense, but it adds a new problem. The smallest of movements will make the whole shot blurry, and we’re trying to prevent that. We want to keep the camera as steady as possible. The best way to do that is use a tripod. Some tripods have traditional straight legs, while other tripods have flexible legs, so that you can take shots in more unusual areas or get a completely different shot. Even then, it might not be an option. You may be in a situation where you have to hold your smartphone in your hand. If that’s the case, then lean against something that isn’t going to move like a tree or a building. It’s also helpful to hold your breath while you’re taking the shot (so your arms don’t move) and tuck your elbows in against your body, because this will keep your arms still. It’s important to remember that any movement in your shot will be blurry. Sometimes that’s what you want, but other times, you want the subject of your photo to be completely motionless. Some smartphones allow you to take photos without touching the screen. For example, you can use the volume controls on Apple’s iPhone earbuds as a remote control, to save you from touching the screen. Something else that you need to think about when you are choosing the settings on your smartphone camera is the exposure. The exposure, simply, is the brightness of your image (effected by aperture, ISO and shutter speed). At night, there’s not much light, so your phone is going to try and make all the light much brighter than it really is. That will make the shadows look gray and the bright colors look far too bright, destroying the image you were trying to get. When you want to prepare for your shot, tap on the screen of your smartphone to set the focus on the subject. You can usually see a slider on the screen somewhere that will let you determine the exposure of the shot. You want to set it in such a way that the shadows appear darker and the colors will be more colorful, showing more detail. When you use the slider, look at the brightness of the highlights and the shadows. Are the highlights over exposed, or are the shadows a grainy gray color? If either of these is happening, adjust the exposure appropriately until you have black shadows and visible color and detail from other parts. At that point, you should have good exposure for your shot, so snap away. On top of that, the shutter speed should theoretically be faster, because the sensor does not need to capture as much light to take the shot. This should reduce the chance of blurry photos from shaking hands or fast motion. This is going to sound really simple, but you need some light for photos at night. Whether it’s a street lamp, or trying to get something a bit different with the sun, you need some sort of illumination. The best way to do this is to juxtapose the well-lit area with darker space, so it essentially frames the well-lit area. This means that people’s eyes will be drawn to the well-lit area. Another advantage of an individual light source is to create a feeling with the photo. You can see with the photo below that the individual cannot be seen, but we know that they are there. The shadows created by the sunrise and the placement of the subject mean that we don’t know who this person is. This creates a sense of drama or mystery, because the subject’s face is hidden. If you can find interesting places to get your shots, keep an eye out for the light that goes with them. It doesn’t have to be one color; you might find that a multiple colors may provide a better look for your shot than one single color. Focus and exposure is important in a situation like this. You want to make sure that the exposure is low so that the subject is dark. You can make the dark shadows in your photo appear much darker to create a more emotional photo. One of the issues that many people have with low-light or night photography is that their shots look grainy. This means that there is a lot of digital noise in the photos, usually caused by over-processing or a lack of light. Reducing the exposure is one of the easiest ways to fix this. 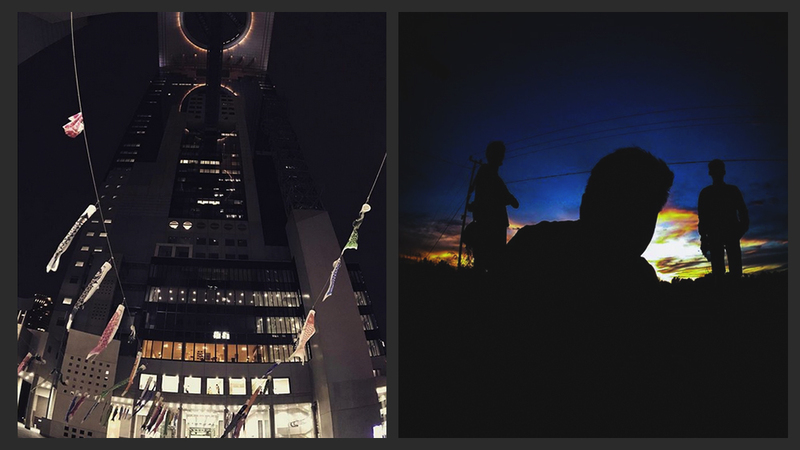 There are also apps you can use like Average Camera Pro (iOS), Cortex Cam (iOS and Android) or NightCap Pro (iOS). These apps are designed to combine more than one exposure of the same shot and then optimize the image. This results in a vast reduction in how grainy your shot looks, and much better exposure. These apps generally suggest a long exposure time, because of the long shutter speed. As a result, a tripod of some sort is recommended. If you don’t want to download an app for this sort of thing, a number of native smartphone cameras has HDR (High Dynamic Range) pre-installed on their native camera app. High Dynamic Range does a similar job to the downloadable apps, in that it combines different exposures and can reduce how grainy your photos look. Check the settings on your device to see how to activate it for your photos. You do want to keep in mind that you don’t want to remove too much noise from your photos, because it can make the photos look soft and lacking sharpness. Equally, you don’t want to over sharpen, because you can make the shot look grainier, which is counter to everything you were just trying to do. Earlier in the blog, we talked about how light directs your eyes towards a subject. That’s particularly true during the night. During the day, you can use roads, rivers – all sorts of things to direct where people should look. At night, that’s more of a challenge. The photo below is one example of how to overcome this in a low-light situation. Light is one of the best ways to overcome this. Rows of lights can be used to direct the viewer’s attention in a specific direction. Use a row of street lights running from the foreground to the background to create a leading line that essentially leads the eyes in the direction you want them to go. Symmetrical is ideal, but that’s not always an option. You can see in the photo below that someone has used the street lights on the far side and used them to direct the eye towards the center of the photo, where they meet the road in the background. This seems odd – why would you want to take photographs of water? That’s not the idea though. Water adds a whole new level to your photography. When you watch TV shows or movies, you’ll often see that the roads look much darker than they ever do in real life. This is a process called “wet-down” where they will spray the roads with water to make them look darker. On top of that, you can use puddles and other areas of standing water to find reflections of the subjects. Reflections can be used to enhance the mood you are trying to create with your shot. Rain is also great for using macro lenses and getting close to raindrops. Set the focus so that the raindrops are clear and the background is blurry, and make sure you adjust the exposure to ensure there’s no over-exposure of the highlights. You can create a truly romantic atmosphere, particularly if you’ve got a shot of two people close together under an umbrella, particularly at night in the right light. In this blog, we’ve talked about short exposure times a lot. However, long exposure times can provide amazing photos as well. Night is the best time to take advantage of light trails and the motion of objects. When you opt for a long exposure time, things like moving cars, trains or stars will appear like a track of light, which emphasizes the motion of the subject. If you’re trying to catch the motion of stars, a fisheye lens will let you capture more of the sky. You can use buildings or the surrounding area as the frame for your shot. Alternatively you can use something closer to change the focal point of the shot There are also apps you can use to assist with your long exposure shots –Cortex Cam (iOS and Android) is a prime example of that, and it’s particularly good if you’re holding your smartphone in your hand. However, you can improve your long exposure photos by using a tripod. While photos at night are going to already be a major contrast between light and dark, you can increase that contrast by editing the photo to be in black and white. Now, it doesn’t work with all photos. You want to have a good mix of bright light and dark shadows for it. In fairness, most of your night shots are going to have this, which gives you the opportunity to show the best features of your shot. By removing color from the shot, you can emphasize the highlights of your shot, those areas that show up in the light. Because the difference between light and dark is so important in such a shot, a wide-angle lens will allow you to capture more of the contrast in the photo. Think of it like the old black and white, film noir style of movie – it can add an increased sense of intrigue to your photo, particularly if there is a lot of dark space around the subject. Something else to consider is that most streetlights don’t produce white light; it’s closer to an orange color. By converting your photo to black and white in the post-production process, you can remove the warm color from your photo that might change the emotional response you want to get from your photo. Many apps, like Instagram, allow you to convert your photos to black and white before your share them, so it is certainly not hard to. Do you have any tricks and tips for getting the perfect shot on your phone? Tag us on instagram or tweet us to show us your best shots. For those using an AUKEY lens, don't for get to sumbit your photos using the hashtag too!